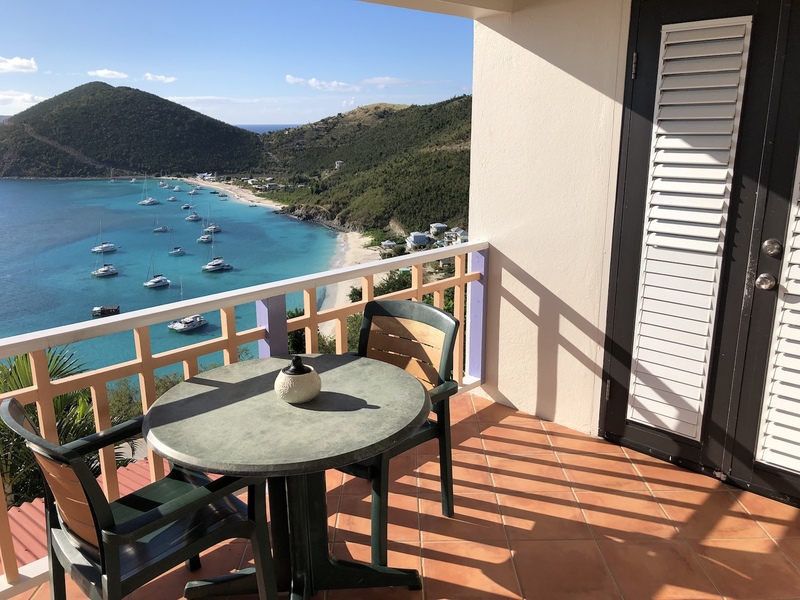 Enjoy the sprawling views of White Bay on Jost Van Dyke in our Hillside Villas perched high above the beautiful and warm turquoise water. Our four identical Hillside Villas with different altitudes for privacy maximize the panoramic views of the entire region. Our guests rave about the incredible island landscaping. Each spacious Hillside Villa boasts a large patio with ceiling fan, tile floors, café table, and double hammock. The upper level has the Master bedroom, with king bed, air conditioner, ceiling fan, and master bath with large vanity, ceiling fan, and private, sunken shower stall. The living/dining room features a flat screen TV, Roku, high speed internet, stereo, ceiling fan, custom built-in café table, and a large custom built couch with a one piece cushion that may be used as a daybed. The kitchen is fully equipped with gas stove/oven, full-size fridge/freezer, fine cutlery, blender, cutting boards, spice rack, coffee maker, French press, all flatware, dishes, glassware, microwave, and ceiling fan. There is a large BBQ located outside. Downstairs with separate entrance is the second bedroom, with king bed, A/C, ceiling fan, and private patio. There is also a full bathroom with large vanity, over-sized shower stall, and ceiling fan. Each of the Hillside Villas are similar, yet unique, with tropical fruit trees and flowers abounding. "We stayed in the Agave Hillside Villa and it was heaven. Relaxing on the porch in the morning watching the boats come in and leave, then going down to the bay and using the towels, rafts and coolers they provided was perfect! Snorkeling in the bay was also the best and the friendly, caring staff even helped us find the right fitting masks! Did I mention the sunsets???"